Published: Aug. 23, 2014 at 11:15 a.m. 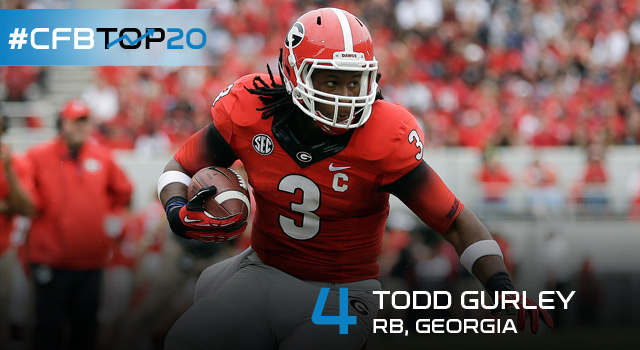 Updated: Aug. 23, 2014 at 11:26 a.m.
Georgia RB Todd Gurley has been at or near the top of the SEC at his position since the day he joined the program in 2012. Last year he missed the entire month of October with an injury and still threatened the 1,000-yard mark with 989. The junior has NFL size at 232 pounds and brings fearless power between the tackles. He also made great strides as a receiver last year with 37 receptions. Look for Gurley to lead the league in rushing this season and, as long as Georgia is within reach of the new College Football Playoff, contend for the Heisman Trophy as well. Throw out a No. 15 ranking by one panelist, and Gurley's standing was remarkably consistent among our analysts. He received the low ranking of 15, but every other panelist had him in their personal top 10. In fact, all had him ranked in their top seven, including two that had him as high as second. No panelist ranked another running back higher on their personal lists. Where do fans rank Gurley? We asked Twitter and Facebook users who they considered the best player in college football. Gurley received 20 percent of the more than 19,000 fan ballots cast, tied for the most among all players to receive votes. He even received a vote from an NFL running back.